How do you begin to teach a dog to lie down? Teaching your dog to lie Down on command is extremely valuable. For one, it allows you great piece of mind if you want to take your dog with you to places such as an outdoor cafe or a family gathering. A dog that can lie down on command and stay that way until given permission to get up can be a welcome guest in most places. Here is a quick video tutorial on one way to teach the down command. 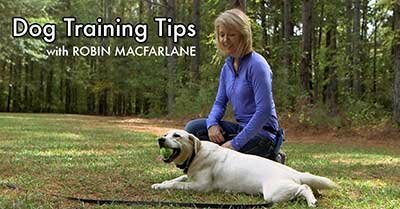 Note: I am not using the E-collar at this time, I am just teaching the dog how to respond to various cues including pressure on the leash, pressure on the shoulder blades, and the lure of a treat (this luring action can later be used as a hand signal). While some people prefer to teach commands with a "hands off" the dog approach, I prefer to teach my commands in a wide variety of ways. By following the protocol I am showing in this clip, I end up with a dog that understands not only verbal cues, but also leash pressure, tactile cues on various parts of the body (in the case of Down it is a slight touch on the shoulder blade area), or the hand signal that the luring action develops. I like this "multi-lingual" approach because it gives me options of how I want to communicate to my dog. For instance, if I am sitting at a table with my dog underfoot and he gets up, I can simply touch his shoulder blade area to indicate to him I want him to lay back down. No words need to be exchanged and I can keep my main focus on a person I may be having lunch with. The same goes for my dog's response to pressure on his leash. If I stop to chat with someone when I'm out for a walk, I can drop some slack in the leash, put my foot on it and my dog understands to lie down, no need to break my conversation with the person I am speaking to. Here is the starting process for teaching these various responses to the cue when teaching the Down. Notice in this beginning phase I am kneeling beside the dog. As things progress I will then graduate to an up-right body posture, but here is session one. Pull-Quote= The hands on approach to teaching your dog "Down"